Armed with the musings of the ‘Twitterati’ the flame and I set off North towards the beautiful Trough of Bowland. The idea was to take advantage of the Autumn sunshine, heft our way over the fells, run down the ‘The Hodder’ and grab a spot of lunch at the Parkers Arms in Newton In Bowland. A trio of characters, Stosie, Kathy and AJ, have revamped this rural edifice. 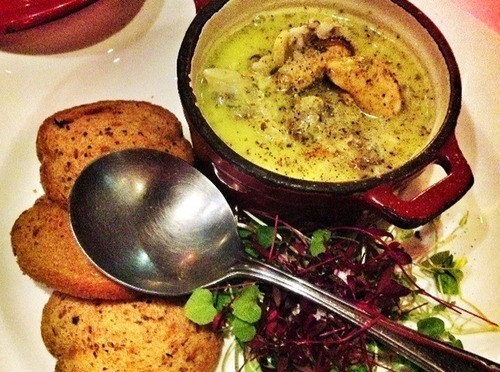 The combination is steeped to the gills in the art of converting great local produce into wonderful home cooked food in a warm, friendly atmosphere. If you get too taken in by the real ales and great wines on board you can hole yourself up in a room upstairs for a modest fee. When we turned up The Sunday Times had just listed it the sixth best budget place to stay. Pride and excitement positively gushed from AJ, our charismatic and genial host. 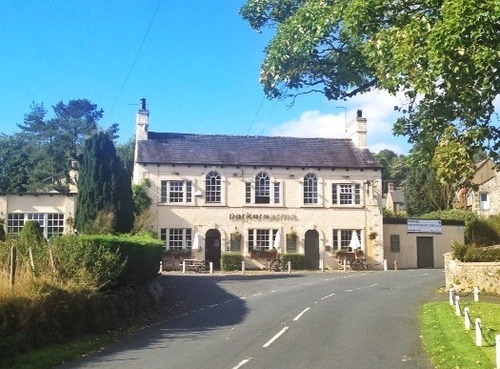 The place is surrounded by great undulations of greenery and the Parkers Arms made a fine and welcome sight as we slew down the hill from nearby Clitheroe. Inside the stone floors of old prevailed alongside the ‘antiquely’ furniture and fireside settings. Indeed I can imagine on a cold winters eve a roaring fire from one of the hearths would be a handsome sight. It is rustic with a capital ‘R’, though touched with elegance and charm. Given the food here is cooked (and not brought in a bag from the distributors!) the menu is sparse in volume, but high on quality. You don’t get Chinese, Mexican, Indian and Italian all on the same menu here. Traditional British pub food is the order of the day and so it was no surprise that I chipped in with the Sunday roast beef. A cut from Burholme Farm in the nearby village of Whitewell no less. Fleetwood (the nearest coast) kindly donated some roasted haddock if you fancied something from the sea. To start, before the real starters. the flame and I tucked into some crunchy, salted potato skins and some soft cheesy puffs. Utterly delightful. For the real start I had a cheese scone made with three Lancashire cheeses no less. It was beautifully soft and mopped up the dressed salad like a favourite sponge. The flame went for the roasted tomato soup. I believe some sort of witchcraft had been involved in the making of this brew. How else could so much flavour be extracted from the humble tomato? It was so good that I was only allowed one spoonful to cast my opinion. It was thick, creamy and had a wonderful kick at the end. The flame went 1-0 up. As stated earlier I had the roast beef, having ruefully spurned the offer of the rabbit and mustard pie that had just come out of the oven and been added to the specials! 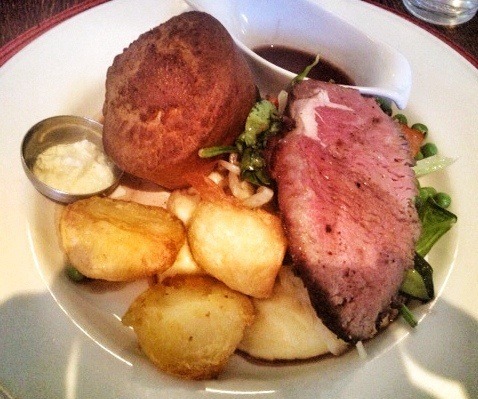 Nonetheless my roast was superb, cooked medium rare as chef Stosie dictated. You had to have special permission to have it well done! The flame opted for a lemon and garlic infused chargrilled chicken with roasted sweet potato and salad. Sufficiently satiated at this point we debated over the dessert menu. We asked our fresh faced young waitress what the ‘Wet Nellie’ was? The uttered narrative prescribed it to be a ‘sort of biscuit base with Christmas pudding, dried fruits, nuts, mincemeat and sticky toffee pudding all rolled into one’. The winter version being hot with custard, the summer version room temperature with Chantilly cream. I am prone towards a sweet tooth, trifle being my top ticket, but ye Gods this sounded too good to be true. Boy oh boy this was a top sweet, oozing with moist fruits, spice and kick all at once. If you come to the Parkers Arms for nothing else, get down to taste Kathy’s Wet Nellie. We then took coffee on the lawn outside overlooking the wonderful countryside. It was all rather agreeable. £50 for two on a Sunday, not bad really. It all took around two and quarter hours which was a bit too long and meant we didn’t quite get as far down the nearby River Hodder as we would have liked, but hey, let’s not quibble, if you want to escape from the old metrop, be welcomed into a time gone by with a cuddly smile and enjoy wonderful, home cooked food, the Parkers Arms is definitely one for your list. Working in Manchester as I do, the word had spread that something special was happening up in the Northern Quarter. Proper burgers with strange accoutrements were being sold from a small, unbranded, backstreet block. The problem appeared to be that you could never tell when it was going to be open. You only knew once you turned up and saw the queues stretching round the corner to get in! Mind you a bigger problem came to the fore, the place got seriously torched. This meant two things, 1) I never got to try and 2) it meant ‘Almost Famous’ was no more. Thankfully it managed to limp forward by opening a shed off Deansgate in Manchester, but also, in a slightly more sure footed guise, it has opened up along the M62 in Liverpool. Given that two of my young, hip relatives have just started Uni in the town it was here that I ventured along with said youngsters and the flame. It took some finding though! Branding is not one of ‘Almost Famous’s’ priorities it would seem. It is housed in an old warehouse in the centre of a derelict part of town, but it is close to the ‘studenty’ action. I tentatively entered first to see if the coast was clear and that this indeed was ‘Almost Famous’. A flashing, young, spouse blade confirmed it was. I waved the posse in. 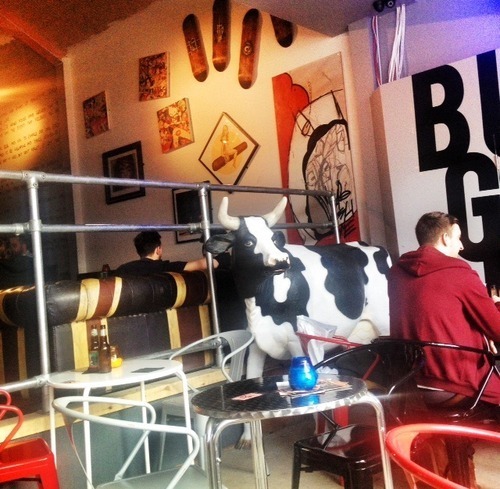 We were met immediately with a blast of loud music, bold graphics and a life sized plastic cow. I was particularly taken with the strap line ‘Burgers Get You Ripped’. Given that my level of ‘rippedness’ was down slightly, I was greatly encouraged to realise the calorific onslaught I was about to consume was going to improve my physique! We attempted to get to grips with the menu, which were fanned out under the up cycled candle holder. A very friendly waitress explained the terms in order to select the correct strength of sauce to wash over our fries and burgers. 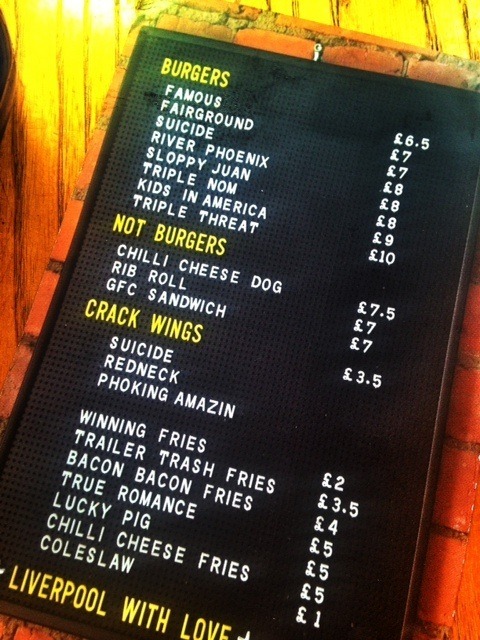 Choices included ‘suicide’ (very hot). ‘Redneck’ (BBQ type) and ‘naked’. The burgers all have names. I’m not too sure of the relevance of each name but basically you get a real, cheshire beef, beautifully, pink in the middle, burger (or two, or three!!) 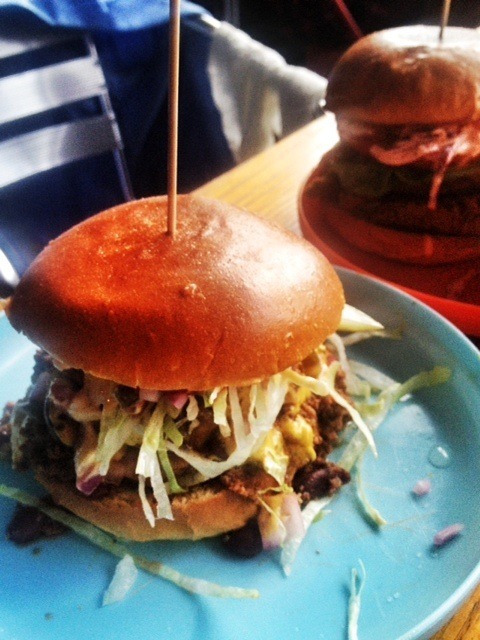 with a combination of cheese, pulled pork, chilli beef, slaw, onions, bacon, salad, gherkins along with a choice of sauce. You can actually get a ‘Not Burger’, which the flame went for, which in her case was breadcrumbed chicken. I went for a ‘Sloppy Juan’ which meant I got two burgers, chilli beef, onion, pickle, lettuce, ‘animal’ and famous sauce all set on a ‘frisbee’! 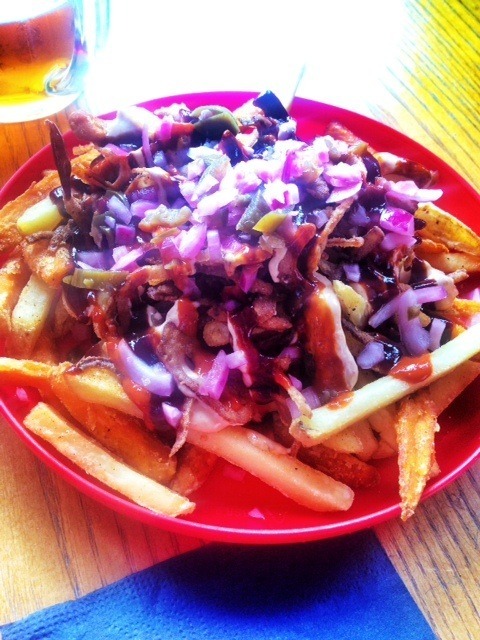 I had it with a side of ‘true romance’ fries. All the fries are 50/50 sweet potatoes and normal potatoes. The ‘true romance’ bit meant they came with bacon bits, cheese, onion, chilli and pickle. They were very moorish. The burgers were properly tasty. Cooked pink in the middle, they we beautifully moist. 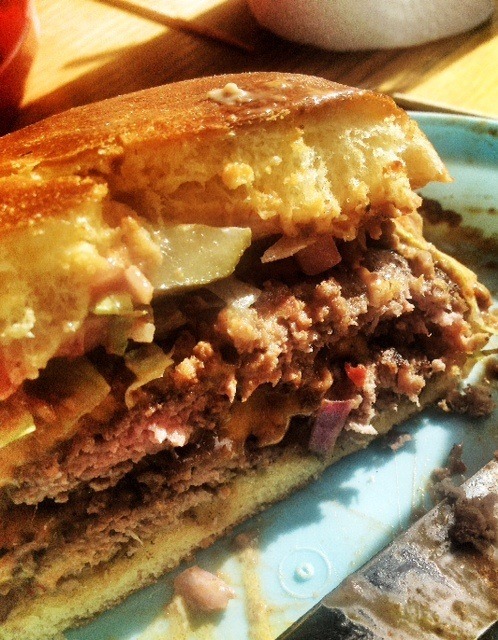 A burger made from real, quality beef is a very good thing and should not be confused with the shrunken, flabby efforts you may have come across. My hard to please southern relatives were completely taken with their ‘Triple Noms’, complete with BBQ pulled pork. 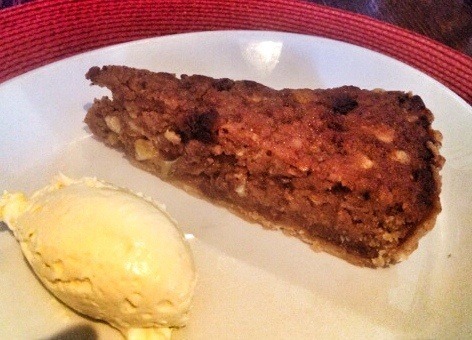 Again, purely for research purposes I tested out a desert. I had a sensational ‘teen dream’ sundae. 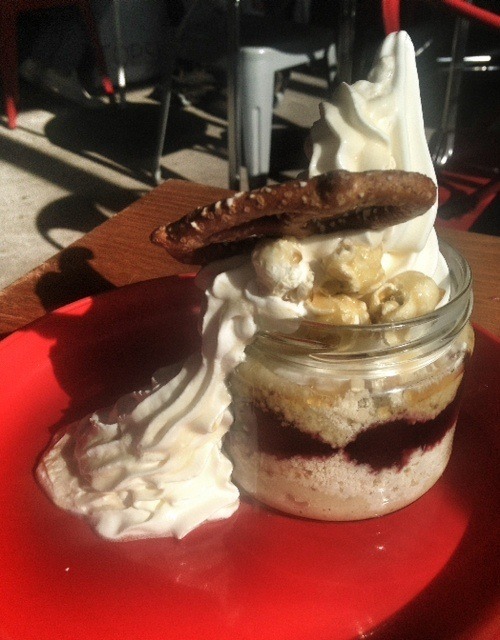 Layers of apple, crumble, cherries, crumble, ice cream, cream, salted caramel popcorn and a smoked pretzel. It was absolutely gorgeous, but finished me off! 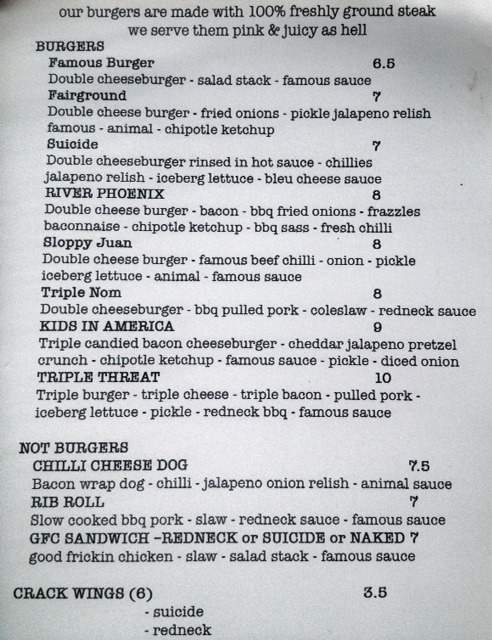 So if you are middle aged and want to get down with the kids, (or impress the kids), then get down to Almost Famous and try one of these beauties. It will set you back a bit, we spent £55 for four of us with fries, but it is real quality. 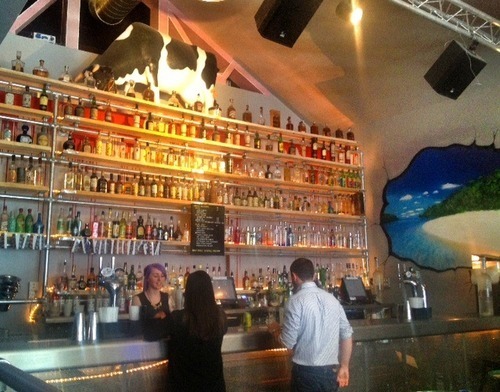 ‘Greens’ as the name suggests, is the place to go for a big fat juicy steak! 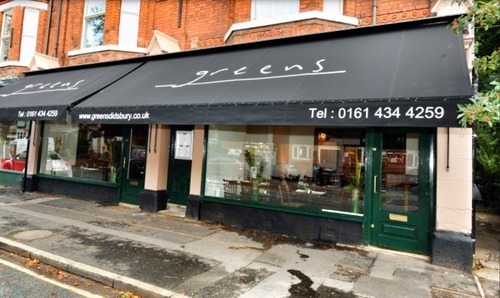 Only kidding, Greens is a vegetarian resteraunt occupying two shop fronts in the Cheshire village of West Didsbury in south Manchester. 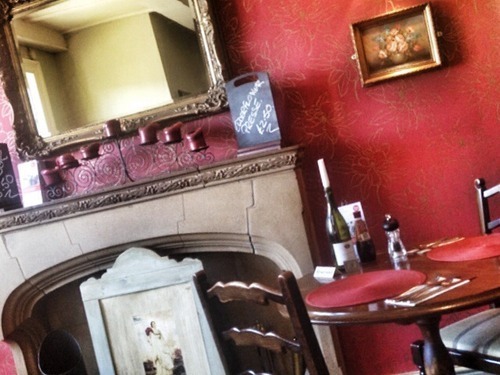 It is just one of the many foodie joints that keep the well heeled, Cheshire set fed and watered. 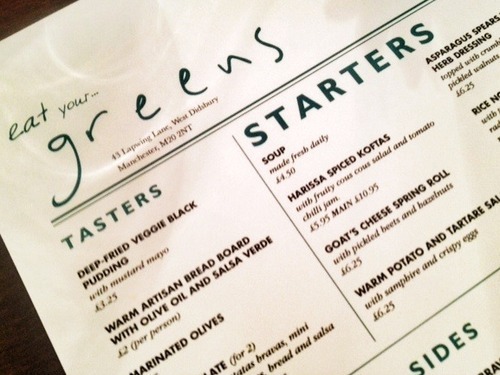 Greens is the brainchild of two Simons, one called Connolly and one called Rimmer. Simon Rimmer is probably better known as the shaven headed TV chef who currently fronts Channel 4’s ‘Sunday Brunch’. Despite being a staunch Liverpool FC fan he seems to be an all round good egg who can knock up some decent scran. The flame and I rocked up on a Friday lunchtime, we were aiming for a 1pm start but the 20 minute scour round for a parking space meant we were running late and feeling peckish. It might be a good idea to venture in on the tram which has just started to skirt the village. Nonetheless once we’d stepped in we were quickly welcomed and settled in by our young, wiry, bespeckled, waiter Anthony. He explained the menu, lunchtime three courses for £19 or a reduced a la carte. We chose from the a la carte. The room is plainly decorated with the odd flock feature wall. Plain, dark wood chairs and tables complete the retro, bistro look. 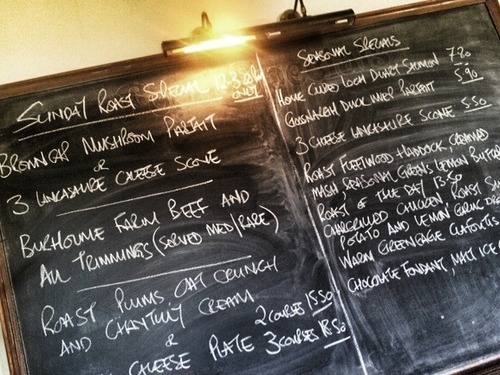 Blackboards pick out the special ales available along with future gourmet nights with ‘The Rimster’ (well that’s what I call him anyway!). 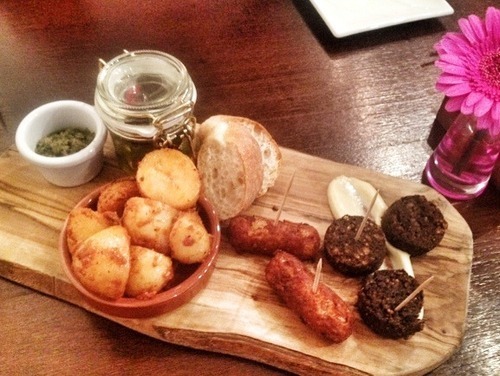 To start we shared a platter (£10.50) of smoked cheese sausages, veggie black pudding on lemon mayonnaise, potatas bravas, olives, bread and a lovely mint based salsa. A cracking start. 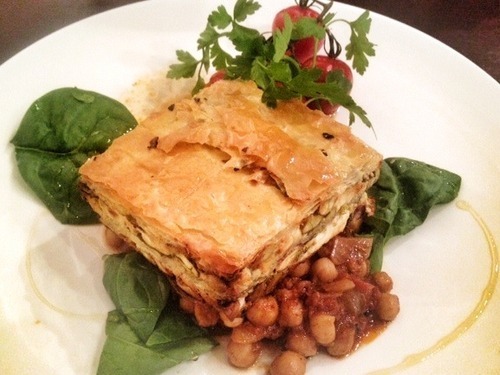 For mains the flame undertook a huge filo pastry pie (£13.50) filled with nuts, spinach and ricotta all settled on a slew of chick pea stew with some vine tomatoes on the side. She heartily approved. 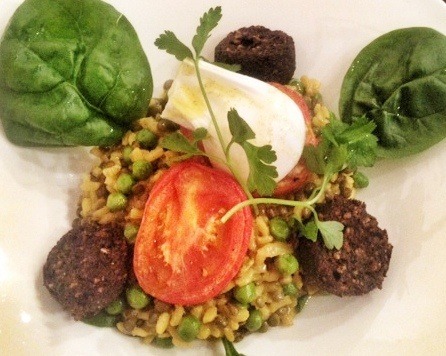 I chowed through a rather agreeable kedgeree (£13.50) which featured the veggie black pudding again. It had lentils along with the rice, all mildly curried with a soft poached egg on top. It was big, hearty stuff, we could have had sides for more money but thankfully we didn’t as we were well stuffed. 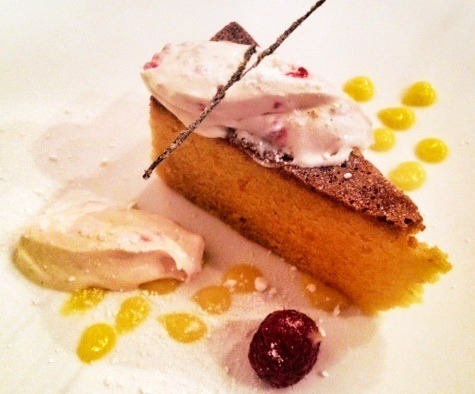 Purely for research purposes I managed to wolf down the ‘Orange blossom, polenta cake with lemon curd and raspberry eaton mess’ (£5.95). The research revealed that this was excellent and that you should keep a bit back for a sweet! All in all this was a stunning meal, perhaps a bit pricey for a lunch (£48 for the two of us) but I can imagine Greens would be a great night out. 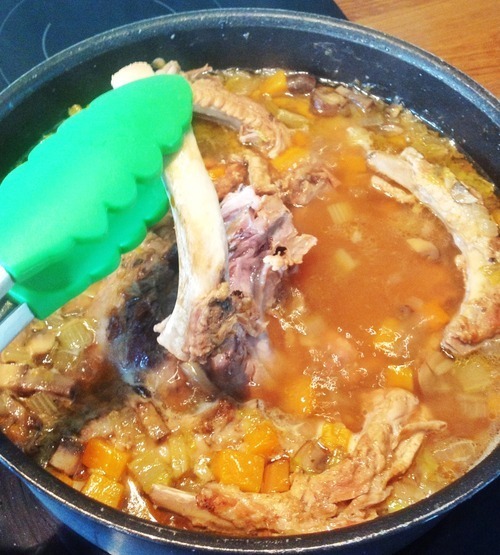 To think that normally we would chose a slab of meat or fish and get some veg and spuds spread round the side. It really is a refreshing change to have the pulse, the grain, the legume and the fruit take centre stage in a meal. So even if you consider yourself ‘a meat and two veg man’ I would fully recommend a trip out to Greens, you will not be disappointed. 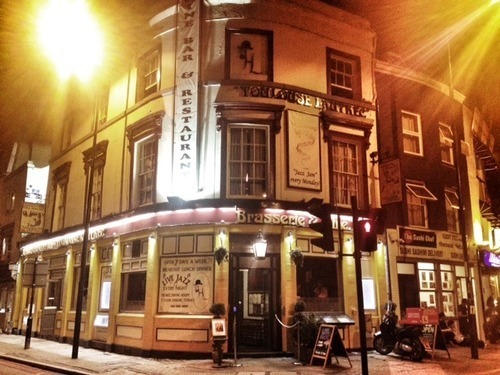 Work commitments found me cooped up in a back street boozer in London’s Elephant and Castle, south of the river. Upon enquiry with my host as to the whereabouts of a decent nosh up, it was suggested the ‘eat as much as you can’ Chinese on the first floor of the local shopping precinct was as good as it gets! I was somewhat perturbed. Further pressure finally coaxed from the depths of his memory murky details of a little French place somewhere close. He even recalled that cockney regular Terry, had “took his a bird there but it cost him hundred nicker’. I pressed further and within minutes I had stumbled into Toulouse Lautrec situated on Newington Butts in Kennington. It was a warm and welcoming entrance, particularly as I was dining without the flame. The dining room is long, narrow and on two levels. Dark wooden panelling and wooden steps gave the impression I was walking onto an old galleon. A very pleasant French waitress set up a single table on the upper deck right by the window looking out onto the busy street. Several tables were already burbling away nicely with business chaps. Jazz music, evidently a big feature of the place was plonking away in the background. Having forgotten my readers the exquisite font adorning the menu made me plump straight for the three courses for £27 special. And ye gods it was special. Starters was a clam and mustard cassoulet, in basil cream and crispy toasts. 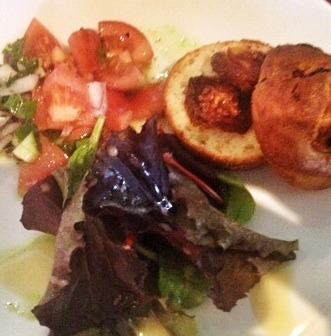 It was absolutely sensational, one of the finest starter dishes I have had in many years. 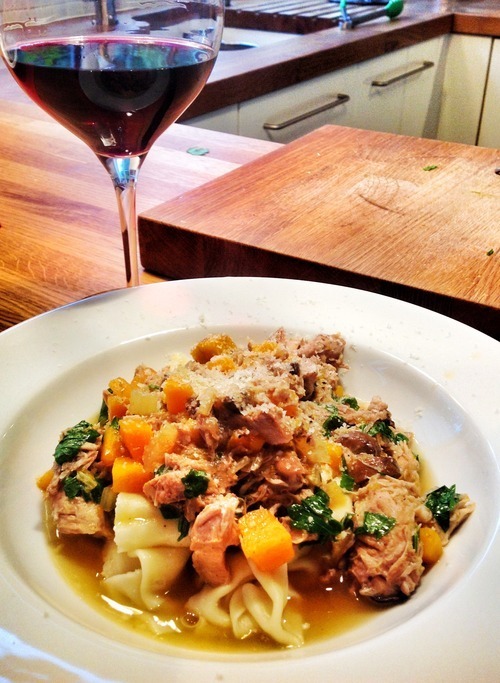 Great flavours and beautifully presented in a small cast iron pot. 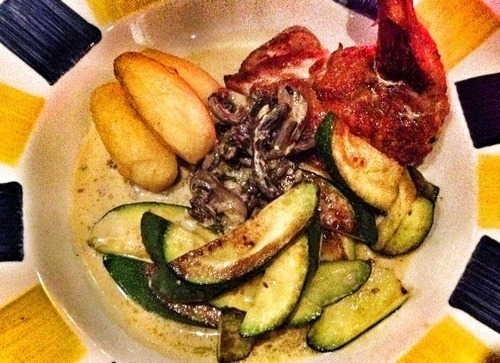 Main course was guinea fowl, courgettes, garlic mushrooms and beautifully soft, barrel shaped fondant potatoes. Set in a large blue and yellow bowl it looked and tasted superb. The sommelier, clearly very talented brought me a glass of light, Spanish red to accompany. All rather grand. As good as this was I couldn’t help looking across with some envy as three chaps dove into a huge hearty bowl of cassoulet to share. The groans of delight seemed to suggest that this was also ‘hitting the spot’. 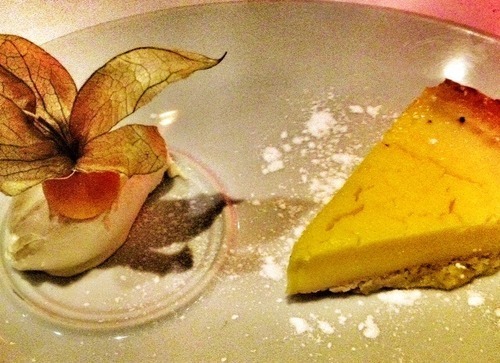 I finished off with my standard tarte au citron, complete with ‘kumquat’! I have to say after what was looking like a night in my room with a KFC and pint of mild, Toulouse Lautrec came bounding to the rescue to produce arguably the best meal I’ve had in ages. So, even as a Northerner helpless in the great Metropolis, I would have no hesitation in wheedling out this gallic gem.